Being the frugal cook that I am, I try not to waste anything when I’m cooking. 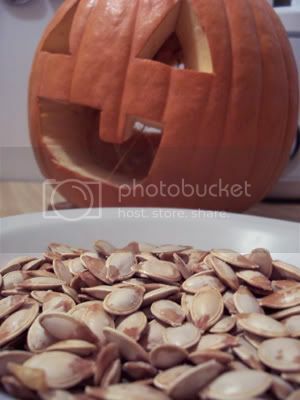 So whenever we’ve carved pumpkins in the past, I always roasted the seeds so as not to waste them. I was always disappointed with the result as they were never as good as the commercially bought ones. They were usually on the flat side, more chewy than crunchy, and were a pain to remove the shell. That is until I ran across this tip for toasting plump pumpkin seeds at Simply Recipes. The recipe suggested boiling the seeds first before roasting, and these came out deliciously crunchy! They were gone in no time and the girls were looking for more. So for about three cups of raw seeds that have been washed and cleaned of the pumpkin core, I boiled about 4 cups of salted water (much like cooking pasta) and cooked the seeds for ten minutes. Drain the seeds after cooking and remove as much of the moisture as possible. I let them dry on paper towels just to get them as dry as possible. Put the dry seeds in a bowl and drizzle with a tablespoon of Olive Oil and kosher salt. Toss to cover as much of of the seeds with the olive oil and salt. Spread out the seeds on a cookie sheet and bake in a oven preheated to 375 degrees F and toast for about 20 minutes or until they start browning at the edges. Try to wait until they cool before eating them. If you’d like to try adding different flavors, which I am going to try next time we toast some pumpkin seeds, try these three ways to toast pumpkin seeds. Hi Stel, ay sayang, next time they’ll know to save it for you.! those shelled pumpkin seeds are so addicting too. yesss! my mom told me the same thing, this past Halloween. malas ko lang, my in-laws thought, baka raw hindi edible???? waaaah. di bale i found raw pumpkin seeds already shelled, i just toasted in a tiny bit of oil and seasoned with salt and cayenne, puwede na! happy thanksgiving J, to you and your lovely family! I love love ’em pumpkin seeds!